Originally Albufeira was an old fishing village, which has become one of the most important and touristic cities of the Algarve over the last decades, but despite the upcoming tourism Albufeira kept its traditional athmosphere. Albufeira is a municipality as well as the name of the famous village located in this municipality. This area has many beautiful sandy beaches like Galé beach, São Rafael beach, Fishermans Beach, Oura and the famous Santa Eulalia beach. 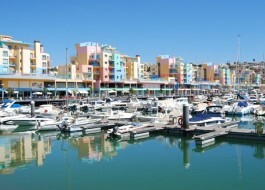 There is also beautiful and colourful marina with several cafes, shops, restaurants and our Albufeira office. The old town is the traditional part of the village. The square offers a variaty of restaurants, shops, bars, live music and entertainment and it is this square that is crowded in the summer by audiences of all ages and nationalities as there is entertainment for everyone! A few kilometers inland from Albufeira village you will still find true traditional Portuguese lifestyle in and around several picturesques villages with beautiful green surroundings and a variety of flora and fauna. Examples of these villages are Ferreiras, Paderne, Pera, Vale de Parra and Guia. Do you want to be near the activities and amenities from a large town but have your home in a more quiet surrounding? Than these villages are perfect for you. Another very attractive village is Olhos de Agua. This village has activity all year round and offers a beach, several restaurants, bars, shops and supermarkets - all on walking distance within the village. Faro airport is approximately 30 minutes drive from Albufeira.